The term toner is thrown around often on our blog, but really what is the difference between toner and an ink cartridge? Toner is a type of ink that is used in laser printers and copy machines. Toner also comes in a cartridge, but the cartridge is filled with a dry, powdery substance made up of carbon and polymer. The powder is transformed into ink when the machine gives an electric charge and then it melts allowing it to adhere to the surface you are trying to print onto. Usually one cartridge of toner allows you to print thousands of pages before needing to be replaced. 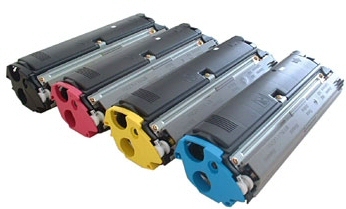 Toner cartridges come in the typical CMYK colors which are best for printing. Laser printers are more expensive than inkjet printers. However, the use of a laser printer and toner allows pages to be printed at an increased speed. Also, since they are etching your document with a laser, your photos and word documents are printed more precisely and with a higher quality. Buying a laser printer is an investment. The price might catch consumers off guard at first but over time the printer pays for itself as the cartridges have a longer lifespan. If printing with a laser printer make sure you give your documents plenty of time to dry as they tend to be more prone to smudge. for sharing the info Simple and straight.